Estimate parts allows you to add the required parts to each of your estimates at the best possible price. You’re able to send price requests to any number of suppliers simultaneously who will then provide quotes. Have a few common jobs that use the same set of parts? Save time by creating part kits using Commusoft's parts management software and adding them to your estimate parts. If you need to add in more parts already in the system or even create new ones, simply type in the name below your list to search for them and click the part in the drop down menu to include it. After completing your full estimate parts list and sending the requests off, you’ll see an email symbol next to each part which has been successfully sent. At this point, you’ll get an email confirming that the requests have been sent with a link to your supplier portal. Portals are a brand new feature that we’re working on to make accessing your vital information even easier and faster. We’re keeping our plans for future portals tightly under wraps for now, but we can say you’ll be seeing some exciting ones pretty soon! Your supplier portal is an additional way of viewing your estimate parts information. Once the quotes have been completed by your chosen suppliers, the data will automatically pull through to the portal and will simultaneously appear in your estimate parts table. 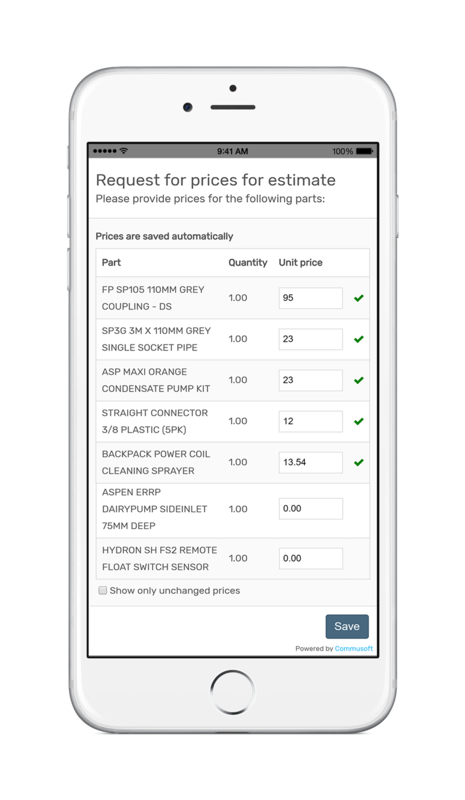 Your chosen prices will also update in your parts management system so you have the most up to date information. Your supplier portal can be viewed from any desktop or mobile browser. Note: Your supplier won't receive a link to the supplier portal unless you include the supplier_parts_quotation tag in your supplier parts quotation email message. You can this up in system settings in the parts section. 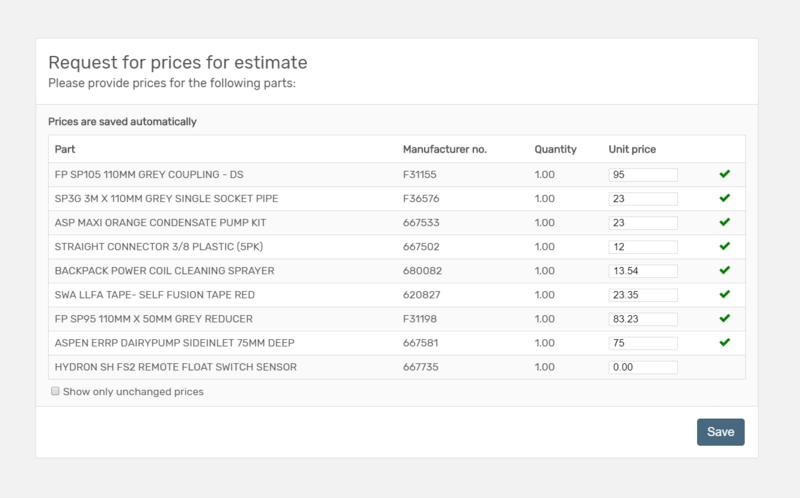 Once you’ve navigated back to your estimate parts table in the web app, you can compare suppliers to find the best price for your company. You can also use filters to check which parts are still pending prices, are outdated, or have been selected by you. If there are any mistakes, it’s easy to manually edit individual prices or mass-edit all the prices for a particular part or all from a particular supplier. Note: If you see a grey clock symbol next to any prices, it means that the quote was given more than 30 days ago and as such, may be outdated. Once you’ve picked your parts, simply add them to your estimate before sending it off to your customer. Once you've converted the estimate to a job, your estimate parts will appear in parts and as a job cost. Your quote request will also be stored against your supplier in the notes section. This feature helps automate processes which would previously have to be done manually through your estimate software and parts management software, saving precious time and resources. It will also ensure that estimates are as complete and as accurate as possible, meaning you won’t lose out on revenue and can keep your records detailed and organised.